Five years ago was a summer of weddings. Weekend after weekend, we were at a church, park, or theater celebrating the happy day of another beautiful couple. But last summer, we didn’t go to a single wedding. Why? Because all of those beautiful couples have moved on to having beautiful babies. We’re now officially in the baby boom phase of life. So I’ve been brainstorming ideas for gifts for new parents. Beyond adorable outfits, practical gear, and brain-boosting toys for their little ones, what gifts do new parents (whether through birth, adoption, or foster care) really want and appreciate? Outdoor Home Maintenance–what a random gift idea, right? But hear me out! When you have a newborn at home, you don’t want to think about shoveling snow, putting down salt, raking leaves, watering the garden, or mowing the lawn. If you voluntarily take on these tasks, consider leaving a note so that the family knows you’re mowing out of love and not because they should be ashamed of their grass that has gone to seed and is ruining the look of the entire neighborhood. Buy mama a massage. Or a pedicure. Or a gift certificate to her favorite salon. With the hormones and tears (both hers and the baby’s), she deserves a little pampering. When you visit, be sensitive and aware. Text or call before you drop by, wash your hands before you hold the newborn, don’t ring the doorbell, and be sensitive to the needs of the parent. Some parents crave the social interaction and want you to stay, chat, and coo over their baby. Others would rather you come and go quickly so that they can work on getting a much-needed nap. Invite a new mom to a play date or mom’s group. Obviously it’ll be a few months before the little one can join in on the fun. These first play dates are all about mom. I remember going to open gym with my infant. Another mom with older kids encouraged me by simply assuring me that someday my baby would sleep. It was such an innocent and unremarkable conversation, but it was exactly what I needed to hear. Instead of advice, offer encouragement. New parents are bombarded with advice. 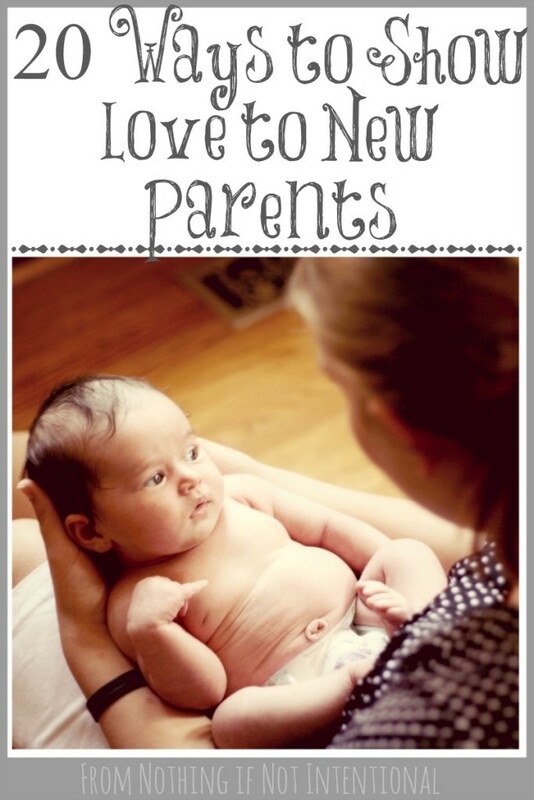 Instead of bogging a new parent down with more things they should do or try, offer encouragement. Compliment the mom on her glowing skin, her easy smile, the baby’s gorgeous eyes. Notice something that’s genuinely going well and point it out. Make those late night feedings easier. Put together a small basket of magazines, snacks, and water bottles for mom (and dad!) to enjoy when they are awake (once again) at two in the morning. Do what you do best. Shortly after our first baby was born, a photographer friend came over and took squishy baby pictures for us. This was an amazing gift to us that we will always treasure. Maybe you could make a baby blanket, monogram a bath towel, personalize a necklace, or design a scrapbook. 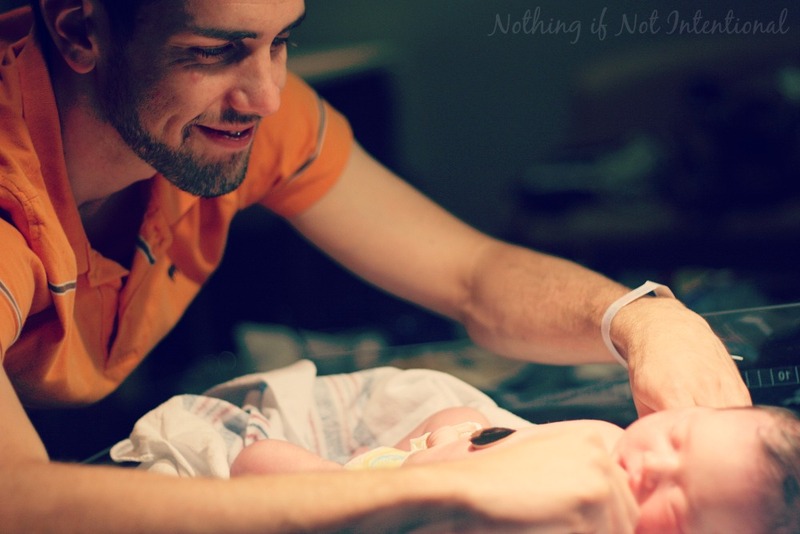 Your hobby, passion, or job could be the sweetest gift a new parent will receive. Bring a meal. This is absolutely my favorite way to show love to new parents. Even if they think they can handle food prep, it’s really nice not have to worry about dinner prep for a few days. Need ideas? Here are a few recipes that are good to bring to others. The meal doesn’t have to be homemade. Maybe you’ll never belong on Top Chef. Don’t fret! 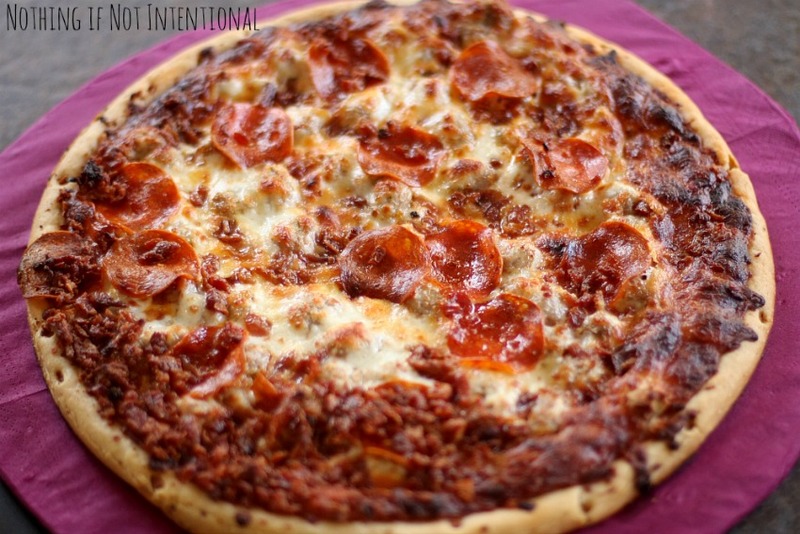 This is why I wanted pizza from Home Run Inn in this post. Takeout and store-bought meals are thoughtful, appreciated gestures to a hungry and sleep-deprived parent. Stock their freezer. Hot meals are amazing, but you can also provide a meal that the family can eat in a few weeks. Does anyone else always have a frozen pizza in their freezer? I keep one around just in case I’m feeling lazy (hey, it happens), or we’re short on time. A few freezer meals may be the very thing a new mom needs to stay sane and relaxed over the next few weeks. Set up the meal train. Another great gift is to be the one who organizes the meals. There are a few great websites that will help you do this: Takethemameal.com and Mealtrain.com are the ones I’ve used. What we’ve found is that three or four meals a week is plenty. With the possibility of leftovers, seven meals a week is too much. Bring over a favorite drink. When you run by the coffee shop, order one drink for you and one for the new mom. Offer to babysit. If there are older siblings, take them out for a special walk or trip to the park. Or maybe it’s the mom and dad who need the walk and the picnic. Either way, you can help by babysitting. Bring a special gift for older children. The new baby will get lots of attention; don’t forget the other siblings. Bring a book, puzzle, or art set that big brother or sister can do while mom is feeding the baby. Make the older child feel special. For more ideas, check out this post for big sibling gift ideas. Take care of the family pet. Even if the new parents aren’t ready to hand over their newborn and head out for a night on the town, they’ll probably be happy to let you watch or walk their dog. Our dog needs lots (and lots and lots) of walks to not drive us crazy. It’s a welcome relief anytime someone volunteers to take her for an extra walk! Wash dishes, run the vacuum, fold laundry, or take out the trash. I’ve heard that some parents are offended by help with household chores. Not me! We usually feel like we can barely keep our house together without a new baby. Anyone not afraid of dust bunnies is welcome to sweep my floors. Hire a housekeeper. Those who might be embarrassed by a friend cleaning their dirty dishes could be perfectly happy to have a stranger take care of a few household tasks. This (someone to help clean) was Nate’s gift to me after our second baby, and it may have been the best gift ever. Go grocery shopping. Ask your friend if you can pick up some basics like milk, eggs, and bread. It’s a pain to get a baby out of the house and into the store for those little necessities! Bring a practical gift. Your friend is probably swimming in little onesies, baby booties, bow ties, and hair bows. Why not drop off a gift of often overlooked (but very necessary) things like nursing pads, more wipes, gas drops, and diapers. Bring a gift that encourages memory keeping–a journal, photo album, shadow box, “baby’s first year” calendar. We don’t want our new moms to feel pressured by these gifts, but all parents know that the days really will fly by. What sweeter gift to give a mom than help capturing those fleeting baby days. Okay, now I’ve told you my favorite gift ideas. Is there anything you’d add? We would be thrilled if you’d subscribe to email updates or pin with us on pinterest! Having you here with us is what makes blogging fun! How can I recommend a pizza brand without trying it myself? Home Run Pizza tasted WAY more like delivery than frozen. I was pleasantly surprised! Since it’s made with real cheese and no preservatives, it’s a great option for families in need of a quick and easy meal. 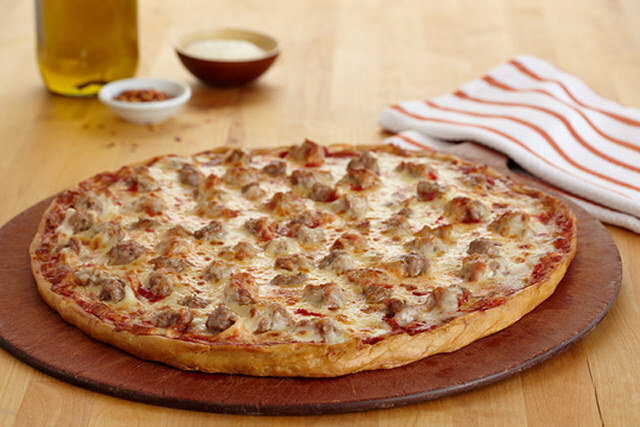 It’s Chicago’s #1 frozen pizza brand, and it’s now being sold in parts of Indiana. Lucky us! 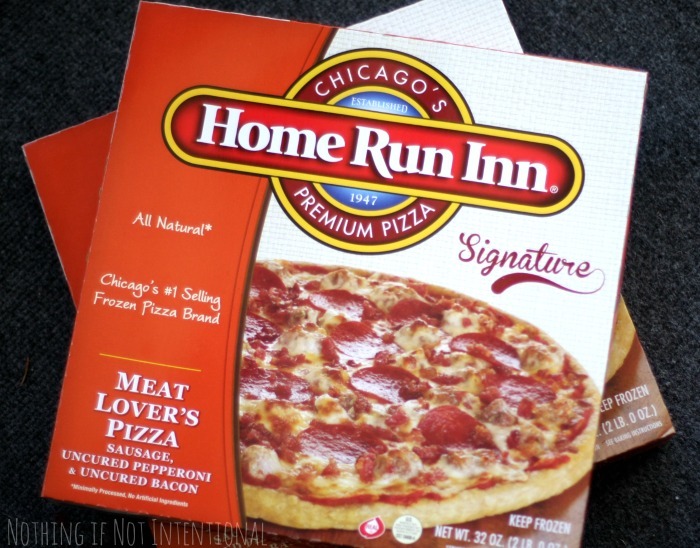 Have you seen Home Run Inn Pizzas in stores near you? ← Skip the Sand Castles! Try Making an Ice Palace. Pingback: 24 Ways to Volunteer with Kids!